It’s high time for another update on Birdy’s language progress. In the three months since I last wrote about her language skills she has made a lot of language progress and is very clearly disproving any myths about multilingualism causing speech delay. Even more, she’s already pretty great at translating between German and Latvian! After a period of trying to use the same word in both languages and observing who reacts to which word, Birdy has now figured out who speaks what and barely ever mixes Latvian and German. That said, she is much more consistent when speaking to her grandparents than she is when speaking to me or hubby. She knows that we generally understand her no matter which language she uses, and even mixes in some words in English! So far the game of “mommy says abc, daddy, says xzy” (more about it here) is working great. It has helped Birdy to figure out that the same thing is usually called differently and to learn new words really quickly. These days she often makes the connections herself, we regularly hear sentences like “mamma: koks, tētis: baum” (tree). We also use this game to check her vocabulary by asking how mommy or daddy call something. While having dinner the other night, I reminded Birdy that she should say thank you after her dad refilled her plate, by saying in Latvian “paldies, tēti” (thank you, daddy). She automatically repeated “paldies, tēti“, then stopped, considered it for a moment, and corrected: “nē, mamma: paldies, tētis: danke”. Overall, by now our girl can speak in full sentences, although her Latvian sentence constructions are still a bit ahead of her German ones. She knows the main colors in Latvian and German and can count until ten in all three of our family’s languages (English she taught herself, more about that below). She loves making observations and commenting on absolutely everything, including things that she does herself: Birdy runs! Birdy laughs! She often remarks what she finds tasty, likes, doesn’t like, or is afraid of. Particular favorites that currently receive the “Birdy likes” label are playing with various family members, and airplanes. She also loves helping and being involved, at least judging by how frequently I hear “Birdy helps” and “everyone together” (visi kopā) or “everyone helps” (visi palīdz) these days. As you can see from the examples above, she still mostly refers to herself in the third person. I have heard her exclaiming “ich auch!” (me too!) in German a few times, but I suppose it will take her more time to figure out the proper use of “me” and “you” in Latvian as she doesn’t hear conversations between other people as often. Also, quite typically for her age, most of the time Birdy uses the infinitive form of verbs. Latvian continues to be Birdy’s strongest language, the one she makes the most complete sentences in. She has gotten particularly good at making clear what she wants, e.g. by using phrases like “not this one” (šito nē), or “better that one” (labāk to). She can describe most things she sees by remarking on their location, size, and color. Although one can already understand her easily, it will likely take quite a lot of time to learn the right word endings in Latvian. You see, the language has different endings for male and female nouns as well as adjectives, and the word endings change depending on the grammatical case (we have seven cases in total). Not an easy thing to master! 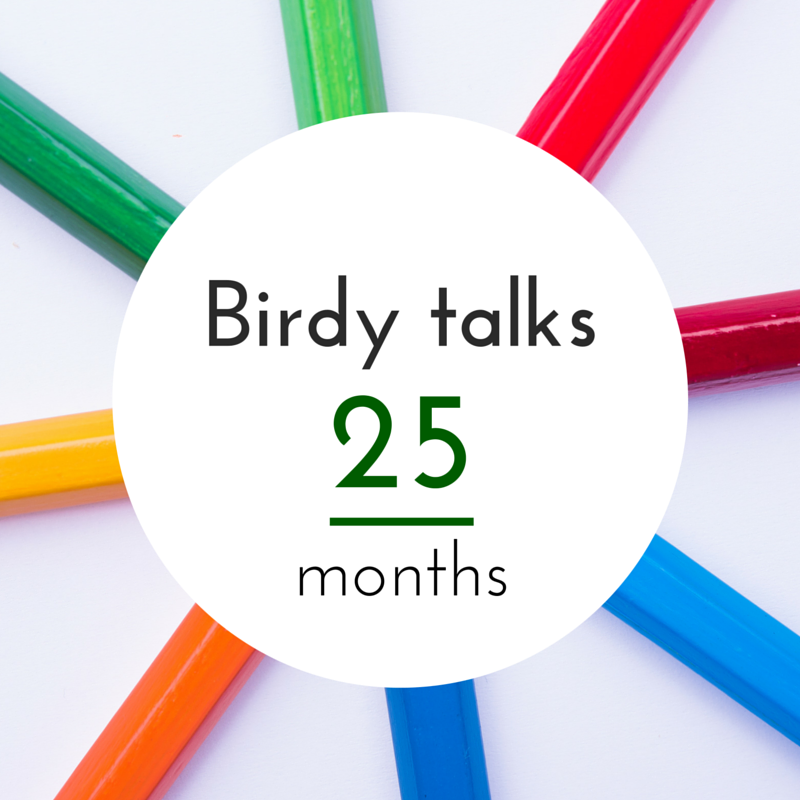 As Birdy doesn’t use German with me, I have been surprised several times about her German language skills when hearing her play with her dad or grandma, or even by listening to her interact with the nurse at the doctor’s office. If she hears me speak German to someone, that’s what she does as well. While in Latvian word endings are the tough nut to crack, in German it’s the articles of nouns. Birdy’s first word with an article was “die Maus”, courtesy of her currently favorite soft toy – a mouse. Once she noticed that also other words have articles she started using “die”, i.e. the female article, for almost everything else as well. It will be a while until she can distinguish between “die”, “der” and “das” but I have no doubt she’ll master that before me. Birdy’s comprehension and use of English is currently the most fascinating to me because nobody speaks the language to her on a daily basis. What she picks up she has learned from listening to me and hubby speak to one another, as well as as from watching Peppa Pig (my better half doesn’t approve of the German translation so she mostly watches it in English). She pretty much taught herself to count to ten in English and, funnily enough, despite initially mixing up the order of numbers in Latvian and German, in English she has never made mistakes. Particular English language favorites at the moment are “ready, steady, go!“, as well as “this one” when, e.g. bringing me a book, “look” when showing us something, and “see you later” when leaving the room. Interestingly, the similarities between German and English, in addition to hearing us parents speak English to one another, have caused some confusion about the right words in each language. For example, the other day she claimed that “mamma saka gurķis, tētis saka cucumber” (the word in German in this case is close to Latvian: Gurke), and she often tells her dad “good night” instead of “gute Nacht“.